During this period in the wool market, it seems to be performing as a more predictable beast than usual. Market rallies strongly – growers sell – buyers lose orders because market is “too hot” – market retraces – growers pass-in higher levels – market recovers – buyers receive increased orders – market rallies …….. repeat!! 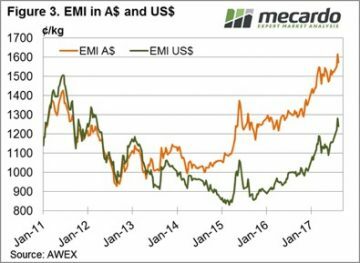 The EMI closed lower again this week, losing another 14 cents in A$ terms to settle at 1,558 cents, while in US$ terms the market corrected 9 cents (figure 1). The WMI had last week out of the sales roster so had to play catch-up to the falls of last week; it was 71 cents lower than the previous close of a fortnight ago. The underlying story for this week however is positive, the market opened on Wednesday with “red ink” across the board, but a reversal on Thursday was clear, with gains of 10 – 20 cents across all microns and the market finishing on a positive sentiment. Again, it was the finer types (18 MPG and finer) where we saw the stronger competition resulting in a net higher close than last week, especially in Sydney. These types all posted gains, with the comment from AWEX that this was led by the better style wool. 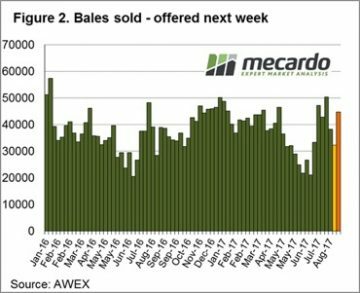 Growers again took an aggressive position to the easing market to pass-in 10% of the offered wool, resulting in 41,261 bales sold for the week, just above the 38,000 average bales cleared per week for this year. This pass-in rate is high when compared to the season average of 7.3% passed in and 5.5% average for last season. Last season the EMI averaged 1385 cents, with a season average pass-in rate of 5.5%. So far, the EMI average for this season has been 1528, with an average pass-in rate of 7.3% and double digit rates over the last two weeks of 14% & 10% respectively. The high pass-in rate, and therefore show of confidence by growers, is understandable. 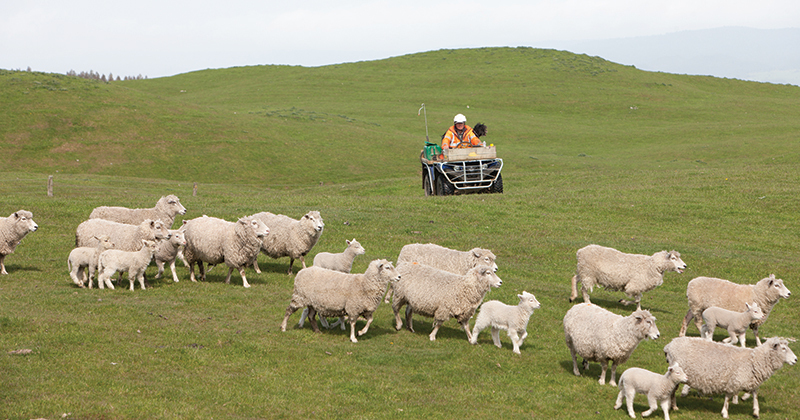 With excellent sheep and lamb prices, and the high wool price, wool (sheep) producers are in a good position financially and therefore are prepared to pass-in and hold wool away from the sale on any show of softness in the market. Next week 42,872 bales are rostered (Figure 2). The pattern over recent months of correcting but quickly recover as growers hold wool back from sale was again in evidence this week. This suggests that next week will see a continuation of the positive sentiment evident towards the end of this weeks sales.